I just returned from a wonderful 2 week tour stopping in Pittsburgh, Chicago, South Bend Indiana, 4 stops in Wisconsin and Yellow Springs Ohio. It was truly a fun tour! Mira and I were joined by my booking agent, Chandra Nerbecki and my nephew Shane who has been touring with us all summer. 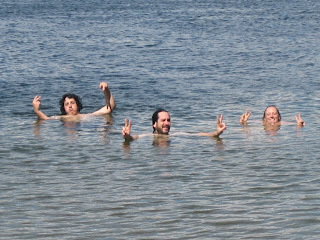 (The Photo is of me, Shane and Kelly Bodden blissing out in a beautiful lake in Stevens Point, WI). Funny how tours can be so nourishing to the Soul and exhausting to the body - that swim sure felt good! So, it's nice to be back home for some rest now. This weekend Mira and I head to the Jersey shore to be with family. Should be sweet! We are also really looking forward to our next outing to Nashville next weekend - August 23/24 to Yoga Source (www.yogasource.info). This trip also includes a trip to a legendary spiritual and sustainable community called "The Farm" (www.thefarm.org). Then on September 7th we play at a really wonderful event called "The Yoga Month Health Festival" in NYC. This is an all day event with some of the top NY Yoga teachers. I will perform a charity concert/kirtan at 8 pm which benefits Youth Health Alliance and health education for children. Here's the link - www.yogamonth.org/event/yogahealthfestivalsNewYorkCity.php - check it out. Last, there is an article about Kirtan singers, of which I am included, in the September/October issue of Yoga + Joyful Living Magazine. You can pick it up and or check out this link - http://www.himalayaninstitute.org/yogaplus/Article.aspx?id=3095. Well, that's all for now, back to my morning tea and enjoying the peace here this beautiful day.